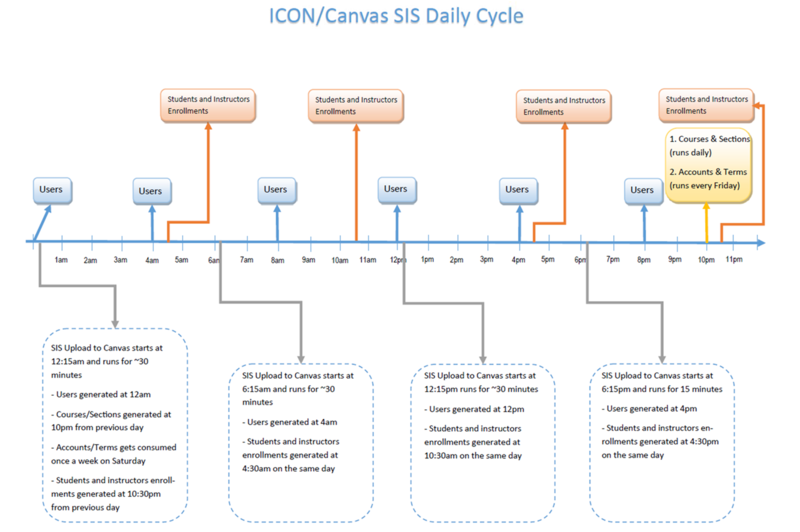 A schedule of what and when information is pulled from SIS data and pushed into our LMS. 12:15am - SIS information is imported into ICON, process runs for about 30 minutes. Users being imported were generated from the midnight pull. 6:15am - SIS information is imported into ICON, process runs for about 30 minutes. Users being imported were generated from the 4:00am pull. Student/Instructor enrollments being imported were generated from the 4:30am pull. 12:15pm - SIS information is imported in to ICON, process runs for about 30 minutes. Users being imported were generated from the 12:00pm pull. Student/Instructor enrollments being imported were generated from the 10:30am pull. 6:15pm - SIS information is imported in to ICON, process runs for about 15 minutes. Users being imported were generated from the 4:00pm pull. Yes! SIS Student/Instructor enrollments export job (on Maui) runs four times a day. It generally takes over two hours to finish during a normal semester. During early registration, however, we are syncing students for more than a semester which increases the time of the job run. Ultimately it interferes with other Maui activities. To avoid this situation, we are going to run the job twice (12:30am and 5:30am) during early registration. Why aren't changes effective immediately? Changes don't happen in real time because multiple systems are in play. Each system's database has to be updated and then the next system pulls that information, etc. These systems are also harmonized with other systems throughout campus and scheduled so as to not put a large load on infrastructure at one given time.